If you are looking for a way to get rid of fat in certain areas of your body, and diet and exercise have not been effective, CoolSculpting may be a viable option for you. The CoolSculpting procedure has been praised for its ability to reduce fat bulges in particular areas of interest. But what is CoolSculpting? When you visit a CoolSculpting clinician, how does the fat reduction work and differ from other methods of fat reduction? CoolSculpting is a scientifically-proven method of fat reduction. CoolSculpting is entirely built and based on the scientific discovery that exposing fat cells to low temperatures is a working way to kill them. First seen when children eating ice pops experiencedfat degradation in the cheeks, the phenomenon continued to be researched by scientists trying to figure out how low temperatures kill fat cells. The process in which cold temperatures kill fat cells is called cryolipolysis, whileCoolSculptingtakes that idea andcreates an innovative method of reducing fat for body-shaping purposes. Many people have stubborn fat that is difficult to reduce with diet and exercise. As opposed to invasive fat-reduction methods such as liposuction, the process of CoolSculpting is simple. CoolSculpting technology can implement controlled killing when targeting fat bulges to kill the stubborn fat cells in specific areas. After those cells are dead, your body will naturally process and dispose of the fat cells over the course of a few weeks. Because the treated fat cells are completely gone, the results of CoolSculpting are long term. In addition to knowing how the process of CoolSculpting works, you might want to know how CoolSculpting is implemented in practice. Before you choose to get CoolSculpting treatment, you need to decide if it’s right for you. CoolSculptingdoes not work to dramaticallyreduce weight, so it isn’t recommended for overweight or obese people. The fat reduction targets specific areas that have excess and stubborn fat so that they can be safely removed. If you think thatCoolSculpting is the right treatment for you, to get started on your fat-freezing journey, the first step you need to take is to consult with a CoolSculpting provider. CoolSculpting providers areprofessionals with specialized training in the CoolSculpting procedure, and they can be easily found in locations near you online. When you meet with your CoolSculpting clinician, your body will be inspected, goals will be set aboutthe ways you want to reshape your body,and then you can start focusing on the specific areas where you want your fat to be reduced. After youunderstand the kind of treatment which is best for you, the process can begin, and your clinician will help you schedule a treatment plan. The CoolSculpting process is then carefully carried out by both the trained professional and a well-designed machine to show full results of fat removal in the specific areas prepared for treatment. What are CoolSculpting treatment plans? Depending on the person, treatment plans may be different. Your treatment plan may consist of just one session, which can range from 35 minutes to 2 hours based on how many different areas that need to be treated. Sometimes, you may have to schedule multiple sessions, but your clinician will make sure to tell you this. During the treatment process, the clinician puts a CoolSculpting system on the specific part of your body where you want fat to be removed. The FDA has cleared the treatment process for visible fat bulges in the submental area, thigh, abdomen and flank, along with bra fat, back fat, underneath the buttocks (also known as banana roll), and upper arm.After the treatment process is over, the results of your treatment will slowly begin to show. The fat cells may be dead, but it still takes time for your body to naturally dispose of them. For some patients, this process starts to take place 3 weeks after their first treatment, but it varies with many patients. The most significant results are usually seen between 1 and 3 months following treatment, and fat reduction may continue to be observed for as long as 6 months after treatment. After the process is over, the targeted fat loss is permanent as long as there isn’t significant weight gain following the results. It’s important to note that there might be some side effects to CoolSculpting treatment. What are the potential side effects of CoolSculpting? There may be some uncomfortable experiences while undergoing treatment, but they are all temporary. For example, during the procedure you may experience sensations of pulling or tugging at the treatment site, but as the treatment area becomes numb, those feelings begin to subside. Typical side effects of CoolSculpting include temporary redness, swelling, blanching, bruising, firmness, tingling, stinging, tenderness, cramping, aching, itching, or skin sensitivity. The CoolSculpting treatment process is proven to be a safe method of fat reduction. Some rare additional side effects may occur as with any medical procedure. However, despite the potential side effects, the CoolSculpting treatment process is proven to be a safe method of fat reduction. There are several ways that CoolSculpting is kept safe for patient use. First, The CoolSculpting procedure is always handled by clinicians who are specially trained in CoolSculpting. The special training is an in-depth certification process to make sure that CoolSculptingis done correctly and safely. The treatment process is always done in medical offices and under the careful supervision oflicensed professionalsto guarantee the highest standards of care.CoolSculpting systems also have built-in safety measures to ensure that your skin is not harmed during treatment. 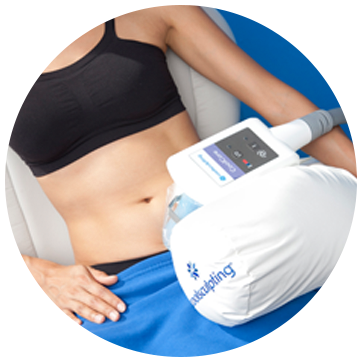 When the sensors detect that the skin is too cold, for example, the CoolSculpting system automatically shuts down. Many people feel confident that the CoolSculpting treatment is not only effective, but safe. All in all, the CoolSculpting procedure is a great method of fat reduction for many people. It’s process is scientifically proven to work, and many high-tech machines are already distributed worldwide to offer CoolSculpting services. To get started, all you need to do is find a medical office near you that offers CoolSculpting—which can easily be done online—and then assess the parts of your body that need treatment as well as a treatment plan. Despite potential side effects which can occur, CoolSculpting is made to guarantee a safe procedure, and it makes the perfect way to slim down that stubborn fat that you just can’t seem to burn off with diet and exercise. If you decide that CoolSculpting is the right treatment for you, all you need to do to get started on your CoolSculpting journey is schedule a consultation with a CoolSculpting provider.